Anthropocene is the brilliant new exhibit which recently opened at the Art Gallery of Ontario (AGO). 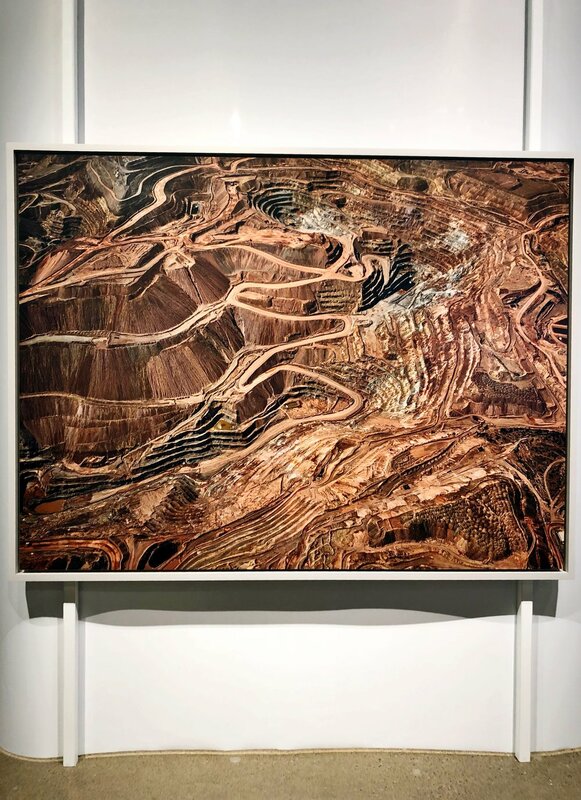 This exhibition features stunning works of art in the form of photographs, murals, film, and augmented reality (AR) installations by world-renowned Canadian photographer, Edward Burtynsky, and award-winning filmmakers Jennifer Baichwal and Nicholas de Pencier. Anthropocene is the term for the proposed current geological epoch in which we are living. It refers to the large-scale, unprecedented impact that humans are having on the world by showcasing locations from across the globe that many people may not have seen or experienced. The photographs and film in this exhibit are breathtakingly beautiful yet devastating when you see and feel the impact we are having on the world. This is a moving exhibit that allows you to reflect on the gravity and scale of the deep, permanent impacts we have inflicted on the Earth and atmosphere, including climate change, species extinction, terraforming, and anthroturbation. Locations featured in the exhibit include Kenya, Italy, Nigeria, the United States, Russia, and Canada. The artists travelled to every continent with the exception of Antarctica to document the irreversible impacts caused by human activity. The artists note that humans now change the planet’s systems more than all natural forces combined, which is the central argument of Anthropocene. This exhibition is a component of the larger Anthropocene Project, a multidisciplinary initiative led by the three artists. The Anthropocene Working Group comprises a team of international scientists who are advocating to officially change the name of the current epoch, Holocene, to Anthropocene, to acknowledge the impact caused by humans on the earth’s systems. Anthropocene is also the name of a film which complements the exhibition, which premiered at TIFF in September. The film is beautiful, meaningful, and deeply moving. It is currently showing at select theatres across Canada. More than a beautiful collection of artwork, this exhibit is particularly important to see and experience to reflect on what we have done to the world and what can, if anything, be done to reset the course we are on to reduce the impacts. The show runs until January 6, 2019. Tickets can be purchased online to make sure you can go at the time/date you want, or try and purchase on arrival at the AGO. Don’t forget to download the free Avara app (available on iTunes and Google Play), which works with three AR installations for an interactive experience.